Whole Grain, Stone Ground, Organic Bread: It’s Good For You! If you’ve been reading my blog, you already know that I’m a big proponent of including grains in our daily diet. Not just any grains, though. Grains that are healthful for us are organic, whole grains, enjoyed either in their whole form or as freshly milled flour. In a study on the association between a high-quality carbohydrate index (CQI) and cardiovascular health, researchers found that a better quality of dietary carbohydrates (measured by the CQI) showed a significant inverse association with the incidence of CVD. 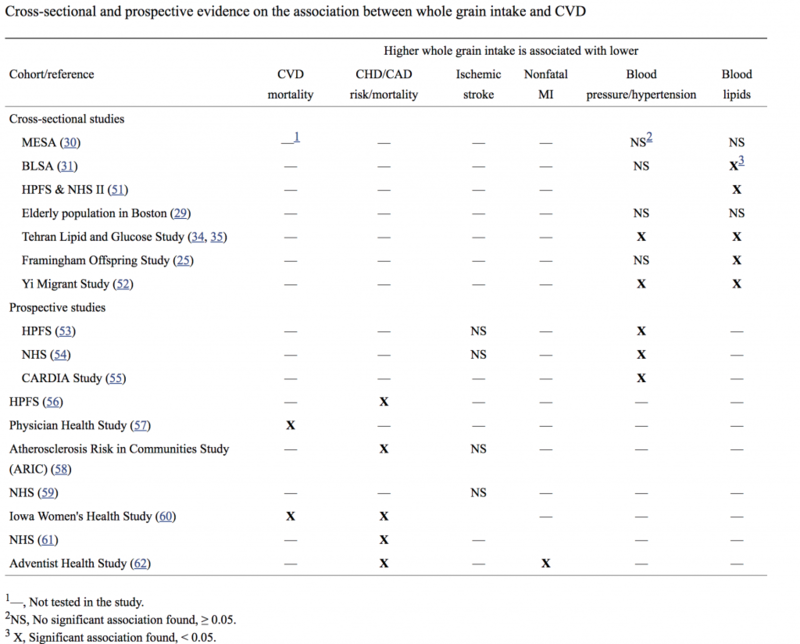 Specially, a higher proportion of carbohydrates from whole grains was strongly inversely associated with CVD. Two clinical trials from Tufts University, published recently in the American Journal of Clinical Nutrition, show that that substituting whole grains for refined grains, even for a short period, improves the balance of intestinal microbes and enhances immune response and energy metabolism. Both studies involved healthy adults (ages 40 to 65), half of whom consumed a diet rich in whole grains (whole wheat, oats, and brown rice) for six weeks, while the rest ate refined grains. Other than the different grains, the diets were virtually the same. The whole grains provided about twice as much fiber (mostly insoluble fiber) as well as some extra nutrients and other potentially bene­ficial compounds. 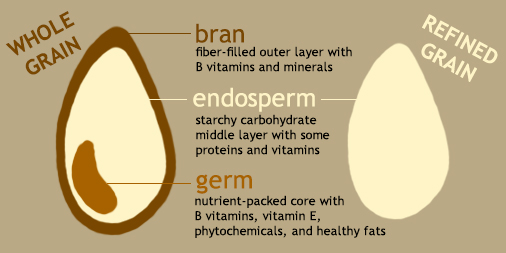 Whole grain foods that undergo processing and reconstitution must deliver the same proportion of bran, germ, and endosperm as that of the original grain to be considered whole grains. The outer bran layer is composed of non-digestible, mainly insoluble, poorly fermentable carbohydrates (such as cellulose, hemicelluloses, arabinoxylan), and the inner germ and starchy endosperm contain viscous soluble fibers, fermentable oligosaccharides, resistant starch (RS), lignans, vitamins, minerals, polyphenols, oils, and other phytonutrients. It’s obvious that including whole grains in our daily diet offers many more benefits than just extra roughage. Researchers are just beginning to recognize the many ways that whole grains improve our health, from nourishing the gut biome and improving metabolism to providing powerful antioxidants that help prevent cancer and cardiovascular disease. Stay tuned for more on this topic—I’ll be sharing some of the ways that bread, made from fresh, organic stone ground whole grains, provides us with a unique source of emotional and spiritual sustenance. Seal CJ, Brownlee IA. Whole-grain foods and chronic disease: evidence from epidemiological and intervention studies, Proc Nutr Soc. 2015 Aug;74(3):313-9. doi: 10.1017/S0029665115002104. Segui-Gomez, M. Nutr Metab Cardiovasc Dis. 2016 Jul 12. pii: S0939-4753(16)30109-0. doi: 10.1016/j.numecd.2016.07.002. Jonnalagadda S, Harnack L, Liu R, et al. 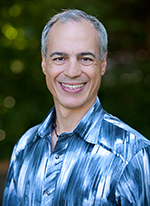 Putting the Whole Grain Puzzle Together: Health Benefits Associated with Whole Grains—Summary of American Society for Nutrition 2010 Satellite Symposium, J. Nutr. 141: 1011S–1022S, 2011. Zhang B1, Zhao Q2, Guo W1, et al. Eur J Clin Nutr. 2017 Nov 1. doi: 10.1038/ejcn.2017.149. Vanegas, S.M., et. al., Substituting whole grains for refined grains in a 6-wk randomized trial has a modest effect on gut microbiota and immune and inflammatory markers of healthy adults, Am J Clin Nutr October 2017 106: 1052-1061; First published online August 16, 2017. doi:10.3945/ajcn.117.155424. Karl, J.P. et. al., Substituting whole grains for refined grains in a 6-wk randomized trial favorably affects energy-balance metrics in healthy men and postmenopausal womenAm J Clin Nutr ajcn139683; First published online February 8, 2017. Adom KK, Sorrells ME, Liu RH. 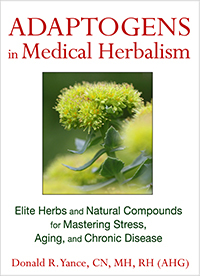 Phytochemicals and antioxidant activity of milled fractions of different wheat varieties. J Agric Food Chem. 2005 Mar 23; 53(6):2297-306. Adom KK, Liu RH. Antioxidant activity of grains. J Agric Food Chem. 2002 Oct 9; 50(21):6182-7. Miller HE, Rigelhof F, Marquart L, et al. Antioxidant content of whole grain breakfast cereals, fruits and vegetables. J Am Coll Nutr. 2000 Jun; 19(3 Suppl):312S-319S. Okarter N, Liu RH., Health benefits of whole grain phytochemicals. Crit Rev Food Sci Nutr. 2010 Mar; 50(3):193-208. Adom KK, Sorrells ME, Liu RH. Phytochemicals and antioxidant activity of milled fractions of different wheat varieties. J Agric Food Chem 2005;53:2297–306.